The gospel is a truth that binds us all together in unity, whether we are high church or low church, mega church or house church, or some mixture in between. The gospel is not something that divides, but unites, and brings us together into the unity of the faith. 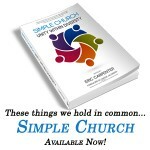 Simple Church is Now Available! Those who are no longer part of the Institutional Church are often only known for what they are against. Simple Church contains 26 thing we are FOR. 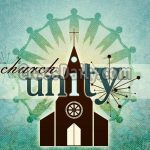 But it is not just what simple church practitioners have in common (in fact, we may not all even identify with that title), but what every form of church has in common with each other. In my opinion, this is a ground-breaking book which will help build unity to all forms of Christ’s church upon the world.